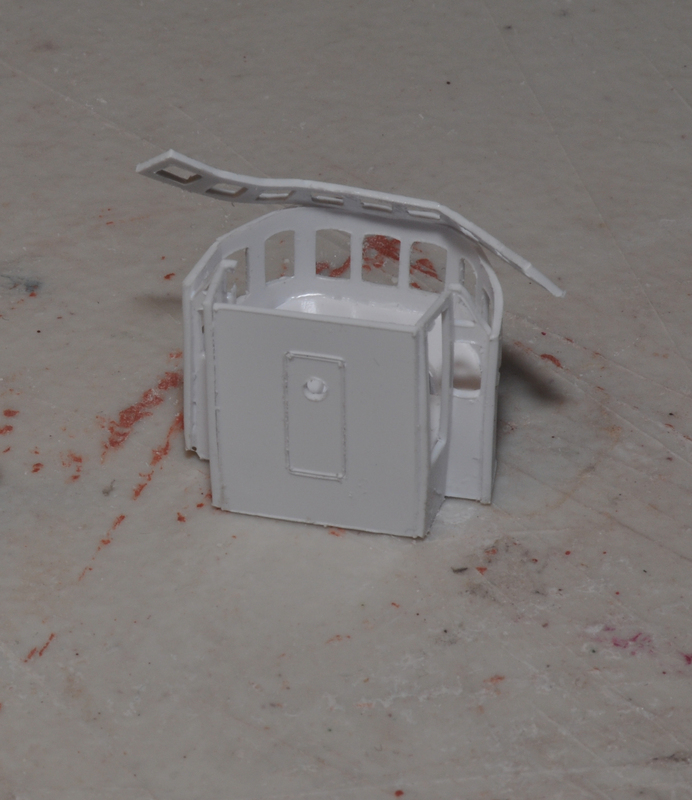 As with most large resign castings, the hull may require some filling of small voids, removal of flash or irregularites, and sanding. 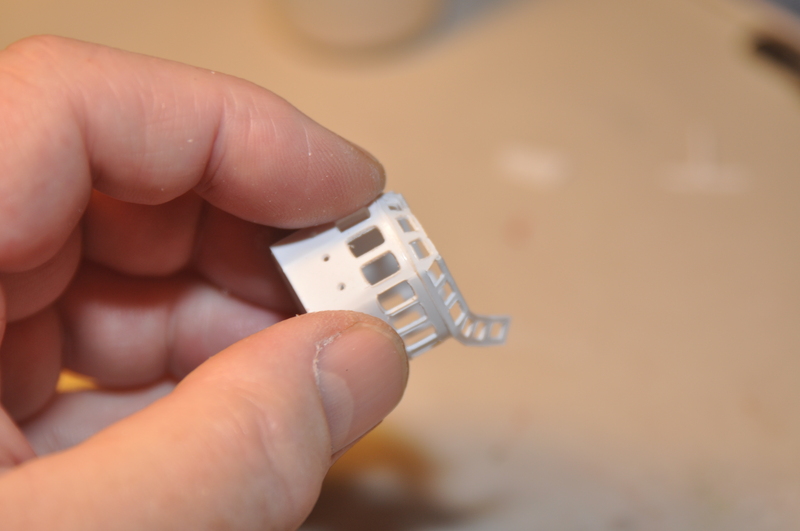 Be sure to wash the hull in warm water with a strong detergent to remove any mold release agent or outgassed resins. 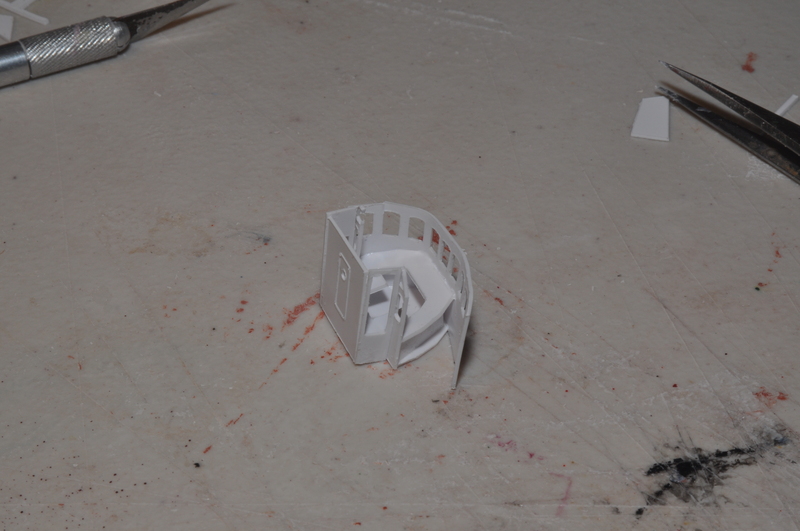 Start by gluing the floor to the rear, which has a high center door. 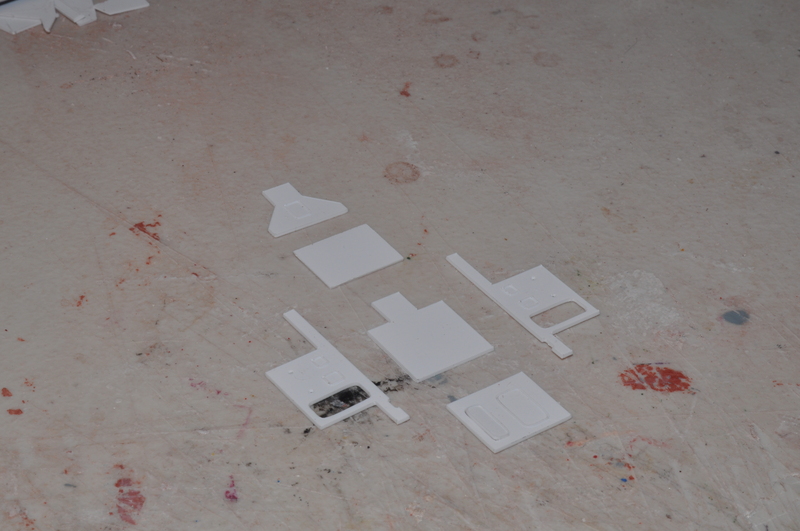 Cut five short strips and glue to the floor as shown. 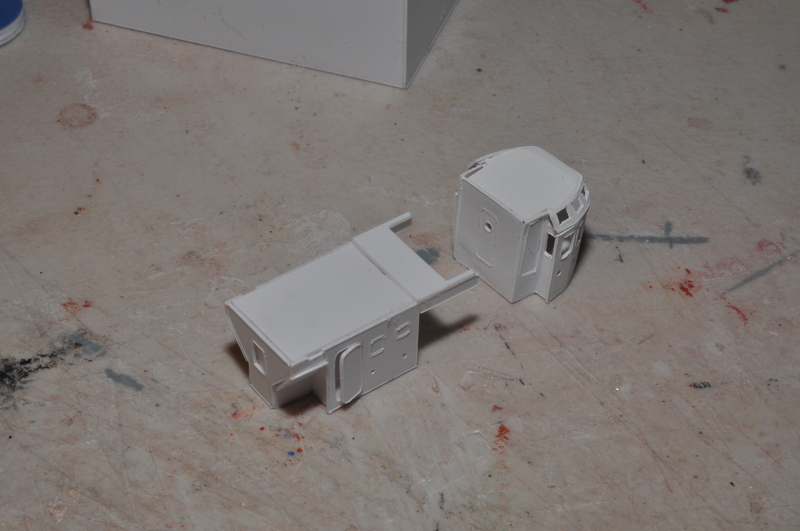 Also shown is the “desk” level and the front wrapper. 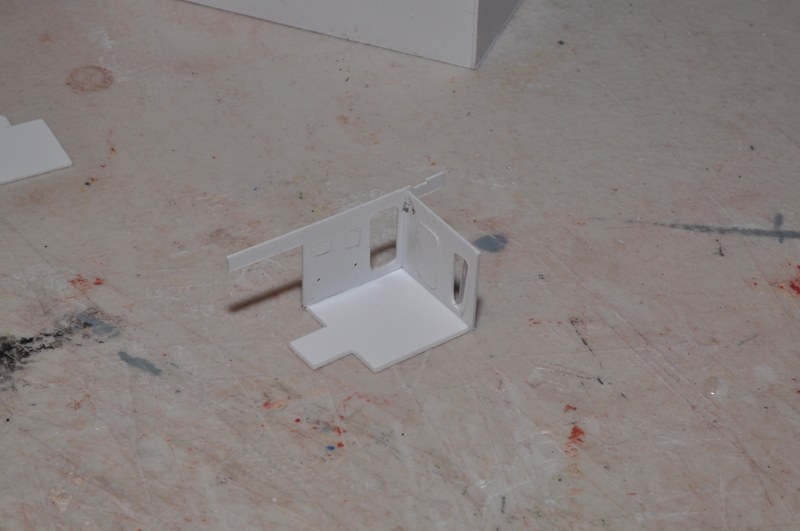 Glue the desk level and then the small vertical walls shown. Beginning at one edge, wrap the front piece around the floor and desk. Orient and glue the top windows all around. The top windows slant inward. When finished, glue the roof on. 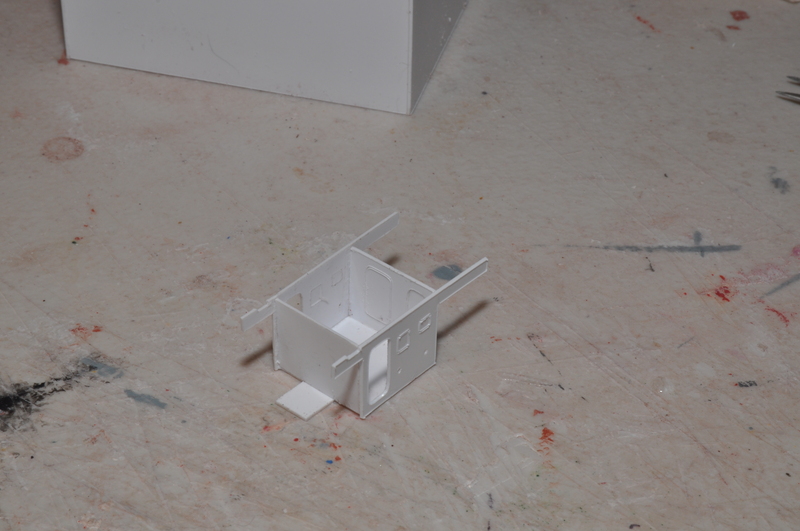 These are the parts to start constructing the rear house. Glue up one side and the front at shown. Side and front clip the floor (instead of resting on top of it). The side clips the front. Glue the other side and the false rear as show. The false rear sides on top of the floor and inside the sides. 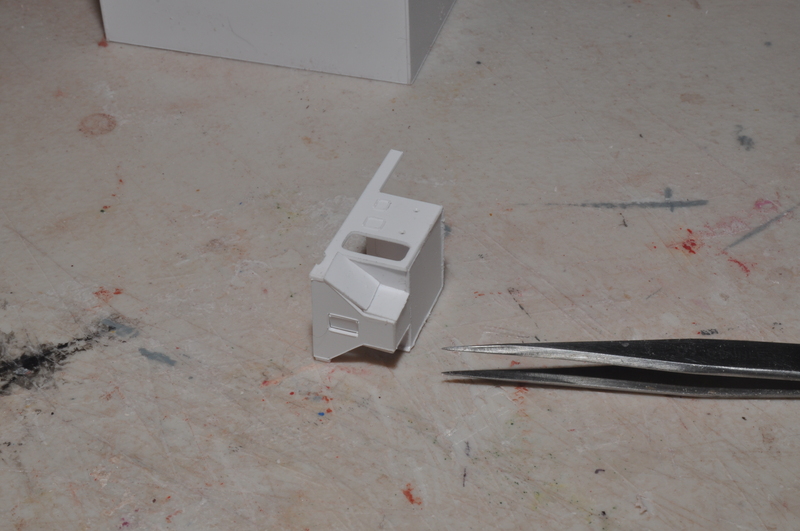 Glue the hopper-shaped rear as shown. 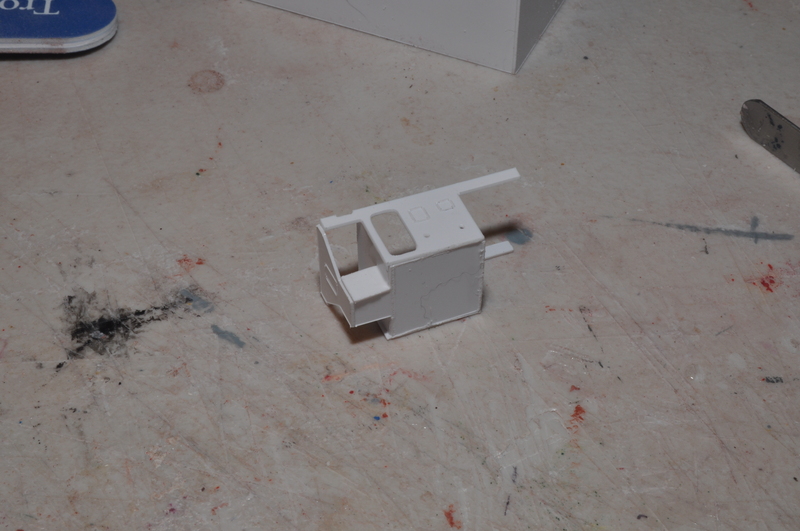 Glue the bottom sides to the “hopper” as shown. 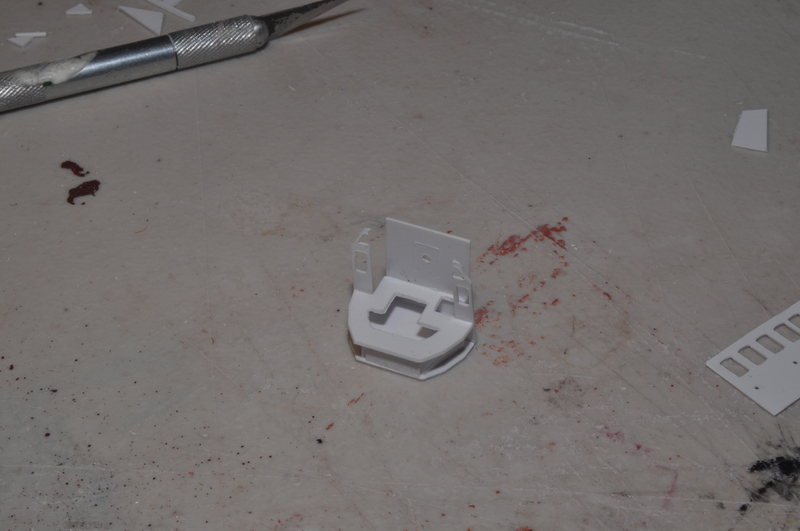 Glue the top undersides as shown. Glue the two roof pieces on as shown. Shown with the pilot house. The four fire hose reels vary in size. 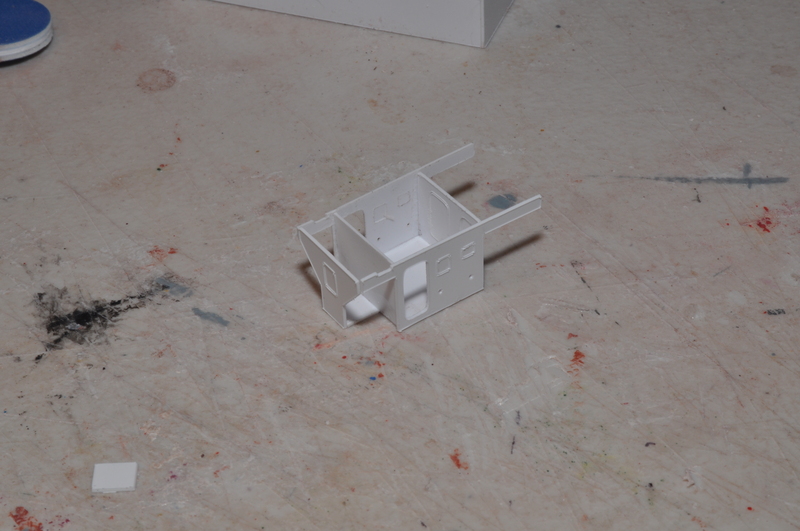 The two larger on on the rear deck; the two smaller tuck under the hopper section of the rear house. 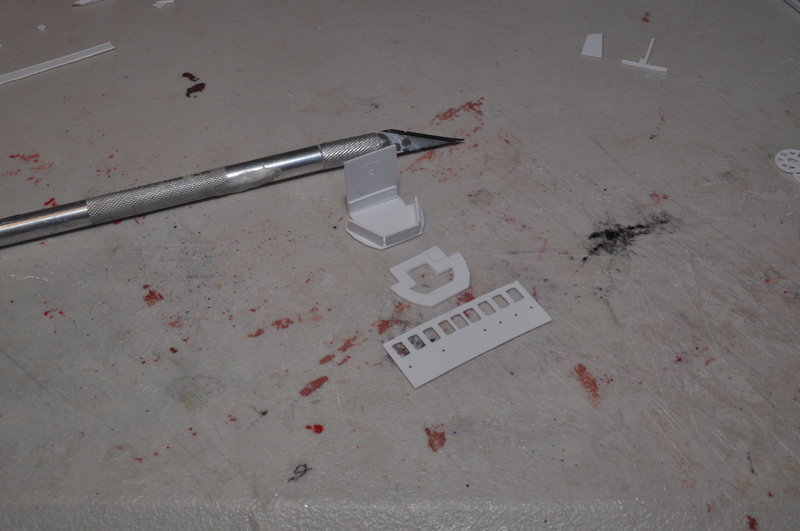 Cut and insert a short length of styrene rod into the center hole of one side and glue, then add the second side and watch to keep the assembly plumb. 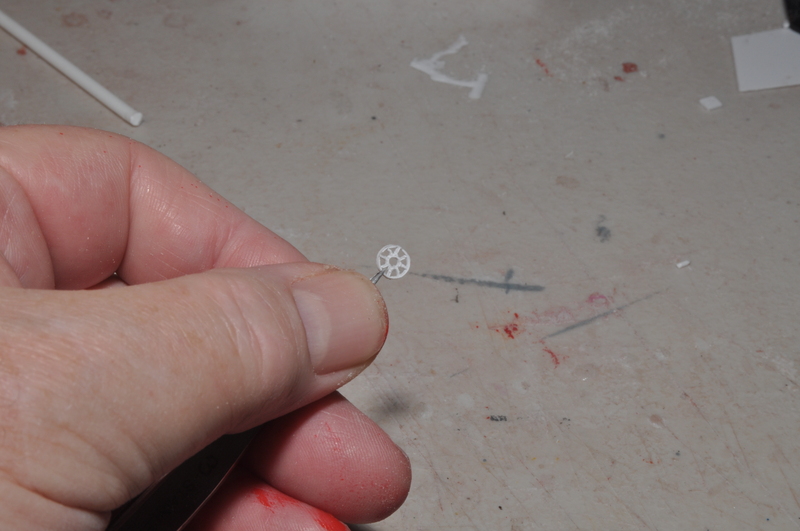 The large reels are essentially “square”: the center rod is the diameter of the reel. 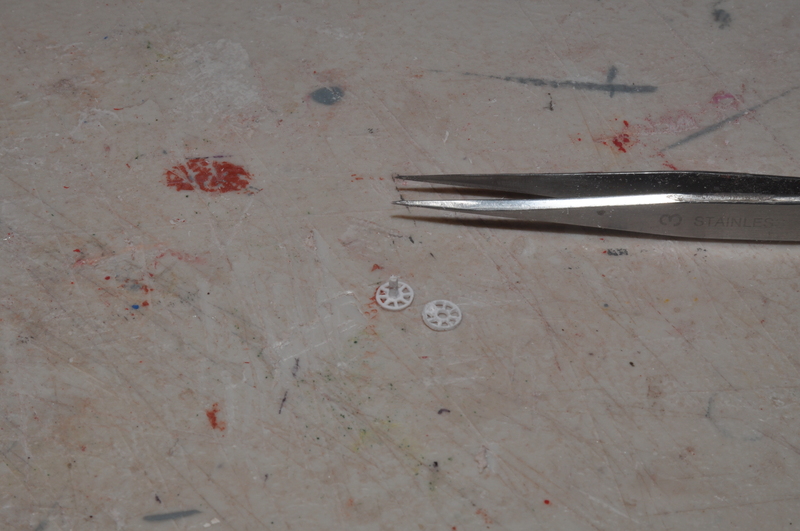 The smaller reels pretty much fill their spaces, so cut the rod length accordingly. I use strips of construction paper for hoses.